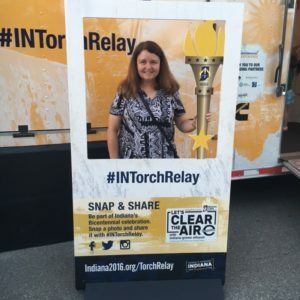 I’ve thoroughly enjoyed viewing all of the pictures and videos from the Torch Relay events thus far. When I finally had the chance to enjoy the festivities in the county where I’m from, I couldn’t be happier. My mother especially had been counting down the days until the torch was carried through Franklin, Indiana on September 23 – just before her birthday. I had driven down from Muncie early in the afternoon on Friday. We didn’t leave our house until my sister arrived later in the evening from Columbus, Ohio. The torch itself had passed through the area from around 5:00 – 5:20 PM. Seventeen torchbearers had been selected, all of them ranging in age and occupation. A common thread that united all of the bearers together were their positive contributions to the people and public spaces of Johnson County. Though we missed the grand event, there were still plenty of activities for us to participate in until 10:00 PM. 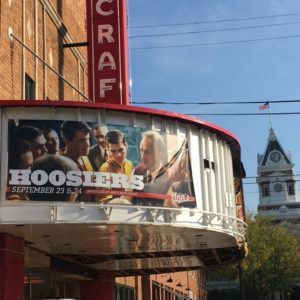 We parked near the Historic Artcraft Theatre, a movie theater that specializes in showing classic films throughout the year. Hoosiers is playing currently this weekend, with Hocus Pocus and Alien playing the following two weekends. I remember visiting the theater once many years ago. The pastor of my church had orchestrated a special screening of Luther just for our congregation. I remember being enamored by the retro feel of both the concession stand and the whole theater. As a self-described old soul, and a lover of old movies, it’s a shame I haven’t visited the Artcraft more often. 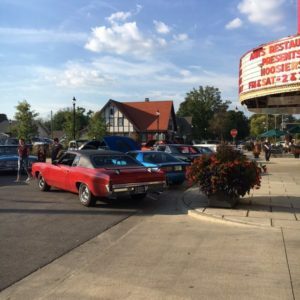 Outside of the theatre, a line of colorful, vintage cars were on display. 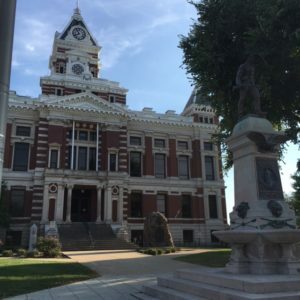 As we walked down the street toward the Johnson County Courthouse, we saw that around the corner there was a generous array of food trucks from various local restaurants. There was also a section with booths devoted to each city within Johnson County. 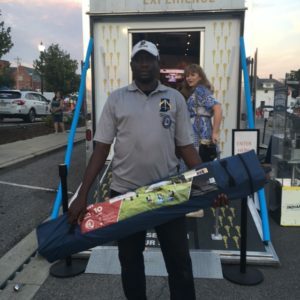 The booths provided historical information about each city, as well as included fun mini-games for those attending the celebration. 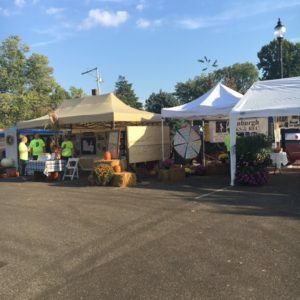 The Greenwood booth had many raffle baskets available to win, including a beer gift box, a collection of pet shampoos, a kindle, and a fall home-decor set. Also in this section was a beer and wine garden. By the time we found the buffalo, it was decidedly time for dinner. We decided on dining at The Willard, a renowned restaurant that my mother has always wanted to visit. The menu consists of primarily pub food, but I choose to order a veggie pizza without cheese. That pizza was a beautiful thing; the crust was unbelievably fluffy, and the sauce was probably the best pizza sauce that I’ve ever tasted. I regret not ordering a larger pizza so that I could have more leftovers for later. After a very satisfying dinner, we headed back towards the bandstand area where a local band, Tastes Like Chicken, were covering an array of classic hits, such as “Crazy in Love” and “Rolling on the River.” The Greenwood Public Library had a booth set up near this area, where my mother, my sister, and I were able to spin a prize wheel and win some pretty sweet pens. When I was younger, I always loved looking forward to the Summer Reading Programs that the GPL would host every year. I also remember attending a workshop at the library where my mother and I learned how to make no-bake cheesecakes. Next to the library’s booth was a booth presented by the Johnson County Museum of History. Once again, I was reminded of a moment from my past; when the Girl Scouts of America celebrated their 100th anniversary in 2012, I volunteered at an event that was hosted at the Museum for local Girl Scouts. Towards the end of our stay at the bicentennial celebration, we visited the Bicentennial Experience, a mobile museum featuring a brief recap of all of the accomplishments that the state has achieved in 200 years. 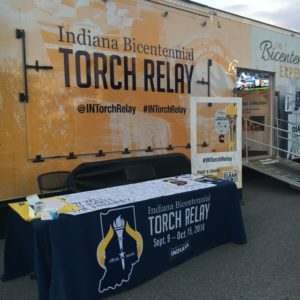 Outside of the mobile museum, there was a banner that anyone could sign, showing their support in continuing to help advance the progress of Indiana in the next one-hundred years. 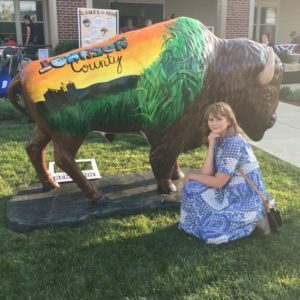 My mother had a great time at the local celebration. To cap off our visit, we stopped by the Mrs. Curl food truck. Mrs. Curl has been an icecream icon within the Johnson County community for as long as I can remember. It was very fitting to end the night on a such a sweet, comforting note. Various memories emerged during my time at the celebration. 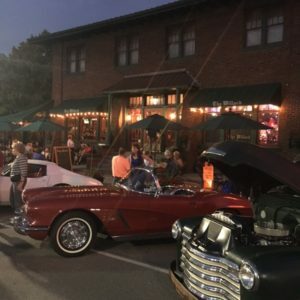 I remember how I completed my Girl Scout Gold Award at the Girl’s Inc. in Downtown Franklin, where I taught young women the importance of leading a health-focused lifestyle. It was also at the Dickson Juvenile Justice Center in Franklin where I volunteered my time as a juror and an attorney for their Teen Court program, an opportunity for minors convicted of misdemeanors to rectify their mistakes in such a way that the event would not be documented on their personal record. In obvious ways, Johnson County has fostered me into becoming the proud Hoosier citizen that I am today. In other ways, I too have given my time and energy back to the community in order to continue making the county thriving, positive place to live. After finally experiencing the Torch Relay for myself, I highly recommend attending the celebrations taking place in your own counties. 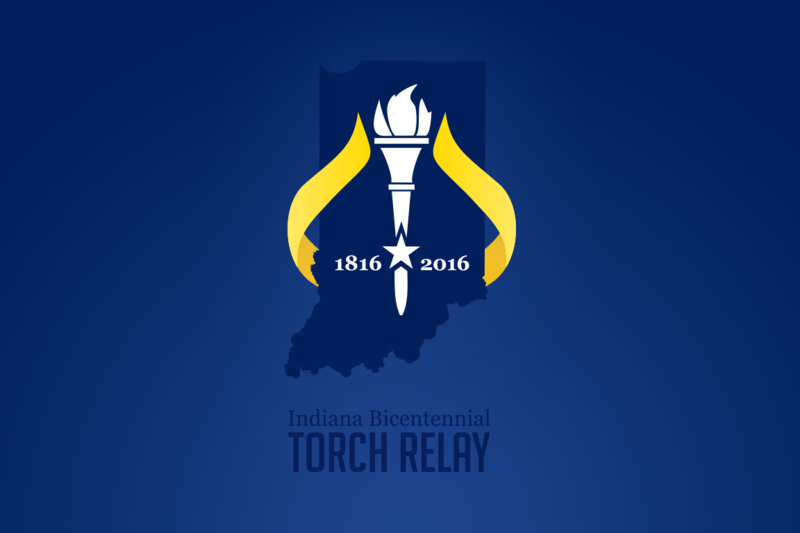 If the torch has already gone through your county, no worries – the Facebook page for the Indiana Bicentennial Torch Relay is full of photos and videos that have documented the relay from the very beginning, all for your viewing pleasure.